Deaf adults and children, like their hearing counterparts, experience a full range of mental health problems. They develop psychoses, sink into deep depressions, abuse alcohol and drugs, commit sexual offenses, or simply have trouble adjusting to new life situations. But when a deaf client appears on the doorstep of an ordinary hospital, residential facility, clinic, or office, panic often ensues. 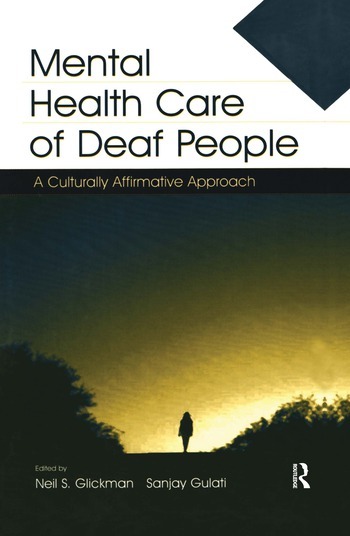 Mental Health Care of Deaf People: A Culturally Affirmative Approach, offers much-needed help to clinical and counseling psychologists, psychiatrists, social workers, nurses, and other mental health professionals--and to their program administrators. The editors, a psychologist and a psychiatrist, and the authors, leading authorities with a variety of expertises, systematically review the special needs of deaf patients, particularly those who regard themselves as "culturally Deaf," and provide professionals with the tools they need to meet those needs. Among these tools is an extensive "library" of pictorial questionnaires and information sheets developed by one of the very few psychiatric units in the country devoted to the deaf. These handouts greatly simplify the processes involved in the diagnosis and treatment of people who in many cases are not good readers--for example, explaining medication and inquiring about side-effects. The handouts are reproduced on a CD included in each copy of the book, to enable purchasers to print out and use copies in their work. This comprehensive clinical guide and its accompanying CD constitute vital resources for all those who seek to provide sensitive, effective mental health care to deaf people. Contents: Preface. J. DeVinney, Prologue: My Story. N. Glickman, Culturally Affirmative Mental Health Treatment for Deaf People: What It Looks Like and Why It Is Essential. S. Gulati, Psychiatric Care of Culturally Deaf People. T. Clark, Psychological Evaluation of Deaf Children. N. Glickman, Culturally Affirmative Inpatient Treatment With Psychologically Unsophisticated Deaf People. D. Trikakis, N. Curci, H. Strom, Sensory Strategies for Self-Regulation: Nonlinguistic Body-Based Treatment for Deaf Psychiatric Patients. J. Vreeland, J. Tourangeau, Culturally Affirmative Residential Treatment Services for Deaf Children With Emotional and Behavioral Disorders. D. Guthmann, K.A. Sandberg, Culturally Affirmative Substance Abuse Treatment for Deaf People: Approaches, Materials, and Administrative Considerations. S. Lemere, Toward Culturally Affirmative Assessment and Treatment of Deaf People With Sexual Offending Behaviors. M.A. Harvey, Does God Have a Cochlear Implant? S. Gulati, Epilogue: When the Therapist Is Deaf. M. Krajnak, Appendix: Contents of the Accompanying CD Skill Card Illustrator.